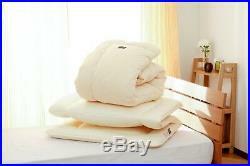 Made in Japan, light-weight, warm, washable"Thinsulate ultra"bedding set, 3item set. 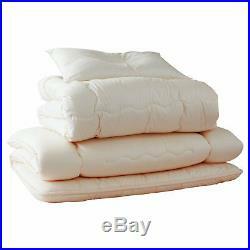 Magic Comforter Thinsulate ultra anti mite, comforter, mattress, and pillow - 3 item set. Thinsulate is a high-performance filling material that has been researched and developed by 3M company. The name has been derived by combining the words Thin and Insulate, and is based on the concept of Warmer and Thinner. Thinsulate is a high density filling material developed by Sumitomo 3M company. Features of Thinsulate, thin, light and warm. The high-performance thinsulate filling material is a non-woven fabric consisting of microfibers of 2 m diameter and polyester for retaining the strength. It is a complex structure containing ultra-fine fibers that are almost as thin as the thinnest tip of down feathers, and the surface area is 20 times that of conventional polyester cotton. This structure encloses plenty of dead air achieving excellent thermal insulation. Comforter is approximately 25% lighter than ordinary polyester cotton futon mattress. Supports natural turning over in bed without any load on the body. Also, multiple layers of air encloses the body's heat without allowing the warmth to escape. 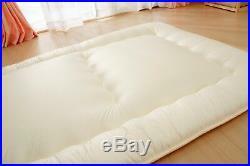 With this fluffy and thick mattress, the floor cannot be felt and does not burden the hips. Thickness of pillow can be adjusted. Users can adjust the thickness of the pillow to avoid straining the shoulders and neck. High density anti-mite material is used for Thinsulate bedding preventing mite infestation. The pillow can be kept clean as it can be washed completely. Slimmer, lighter, and warmer Thinsulate. A mus try thinsulate ultra comforter 3 piece set that meets the modern needs and strives for additional heat retention offering comfort and drapability with its high-performance filling material. This comforter is not Thinsulate ultra-premium 200. Note that covers are not provided with this set. Single size Comforter size: 150 cm x 210 cm Filling: Teijin Mighty Top II Anti-mite, antibacterial, deodorized filling Polyester 100% 1.1 kg Filled with Thinsulate ultra sheets Polyester 55% Polypropylene 45% Side Material: High density anti-mite material used Polyester 85% cotton 15% Product weight: Approximately 2.1 kg Mattress size: 100 cm x 210 cm Wound cotton: Teijin Mighty Top II, anti-mite, anti-bacteria, deodorization filling Polyester 100 % 2.0 kg Solid filling: Polyester 100% 2.0 kg Filled with Thinsulate ultra sheets Polyester 55% Polypropylene 45% Side Material: High density anti-mite material used Polyester 85% cotton 15% Pillow size: 43 cm X 63 cm(1pcs) Semi double size Comforter size: 170 cm x 210 cm Filling: Teijin Mighty Top II Anti-mite, antibacterial, deodorized filling Polyester 100% 1.3 kg Filled with Thinsulate ultra sheets Polyester 55% Polypropylene 45% Side Material: High density anti-mite material used Polyester 85% cotton 15% Product weight: Approximately 2.5 kg Mattress size: 120 cm x 210 cm Wound cotton: Teijin Mighty Top II anti-mite, antibacterial, deodorized filling Polyester 100 % 2.4 kg Solid filling: Polyester 100 % 2.0 kg Filled with Thinsulate ultra sheets Polyester 55% Polypropylene 45% Side Material: High density anti-mite material used Polyester 85% cotton 15% Pillow size: 43 cm X 63 cm(1pcs) Double size Comforter size: 190 cm x 210 cm Filling: Teijin Mighty Top II Anti-mite, antibacterial, deodorized filling Polyester 100% 1.5 kg Filled with Thinsulate ultra sheets Polyester 55% Polypropylene 45% Side Material: High density anti-mite material used Polyester 85% cotton 15% Product weight: Approximately 2.8 kg Mattress size: 140 cm x 210 cm Wound cotton: Teijin Mighty Top II, anti-mite, anti-bacteria, deodorization filling Polyester 100 % 2.0 kg Solid filling: Polyester 100% 2.0 kg Filled with Thinsulate ultra sheets Polyester 55% Polypropylene 45% Side Material: High density anti-mite material used Polyester 85% cotton 15% Pillow size: 43 cm X 63 cmOnly Double size set comes with 2 pillows. We will carefully deliver using the packing material. International Buyers - Please Note. We are "Ito Kiyoshi Shoten" specializing bedding store in Japan. 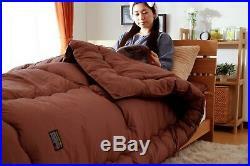 Good quality selection, for your comfortable sleep! It is important for us to get good quality sleep. The good sleep is so effective for our health. Be healthy in mind, body and spirit. We provide maximum satisfaction for our customers! The item "JAPAN, washable 3-piece futon-set Thinsulate ultra, comforter, mattress, pillow" is in sale since Monday, January 21, 2019. This item is in the category "Home & Garden\Bedding\Comforters & Sets". 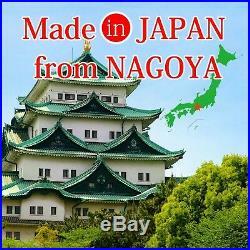 The seller is "itokiyoshi" and is located in Nagoya-shi. This item can be shipped worldwide.